Esplora una delle baraccopoli più grandi del mondo, la baraccopoli Dharavi di Mumbai, in questo tour privato insieme ad una guida. Conosci la storia e la cultura di questa zona e la vita quotidiana degli abitanti attraverso le spiegazioni della guida. Visita il mercato di Dharavi, dove i venditori ambulanti vendono beni di prima necessità, poi visita quattro scuole diverse e Kumbharwada, un quartiere con laboratori di ceramica. 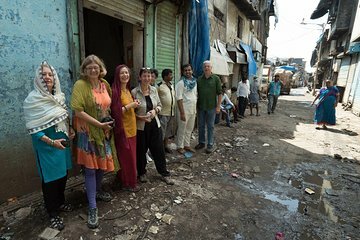 I took the Dharavi Slum Tour with magical Mumbai tours and was positively surprised. I had expected a depressing experience, but it was really interesting to see how the people work and live there. The guide took time to explain everything and even took pictures for us. His English was very good and his knowledge about the slum was profound. Magical Mumbai Tours is an organization led by university students who also want to contribute to the community, so you can also show your support by booking a tour with them. And dont worry: Never once have I felt unsafe in Dharavi slum, and you wont get ripped off either, you will enjoy with them. a small group, we were only 2 people and we had a very informative young man as guide. Tour guide was a no-show. We gave up after after 45 minutes killing time in a sketchy neighborhood. The company had my cell phone if there was an issue or confusion on their end. The tour is run by Magical Mumbai Tours. We also used them for a different tour Private full day Mumbai sightseeing, which was also unprofessional and sub-par. You get what you pay for. Had a very good time. Tour was one-on-one, guide was a resident of Dharavi. He took the time to explain each of the industries, and spoke excellent English. Highly recommended.